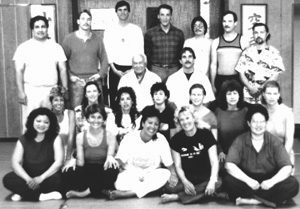 Healer’s Clinic offers five (5) training programs to martial artists or healers. The first is a six weekend course of instruction (theory & application) in Okazaki Massage Restoration Therapy ORT (certification). It is the first component of Danzan Medicine certification. The second program is a follow-on to ORT certification. It is the second component of Danzan Medicine. This course teaches theory, pressure point application, moxibustion and herbal remedies for 50 plus ailments known as Seifukujutsu. The third program instructs students in the art of Zen Buddhist Meditation. The fourth program teaches Dojo Sensei’s the art of Shi Shi Mai or Lion dance. Shi Shi Mai was used to chase away evil spirits or Ja Ki in old Japan. This is a great program for junior students. The fifth program is called the Okazaki School. This training is an Apprenticeship with Professor Kiehl in Asian Body Work Therapy. It leads to national certification with the National Commission for the Certification of Acupuncture and Oriental Medicine (NCCAOM). Interested parties are encouraged to contact us for dates or to schedule a clinic at your site.